The current repeat run on ITV4 is definitely using fuller versions than before. As they are on heavy rotation, I tend to put them on rather than dig the DVDs out and there are parts of each episode that I haven't seen in years. Previous versions had the adcaps and these are lacking here. It would interesting to get the views of more seasoned watchers as to how much is still being left out and what's been restored. 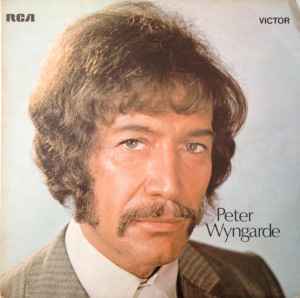 The ITV 4 prints are so worn out I can't bear to watch them. When you have the restored the BDs the difference is like chalk and cheese. From the few I've seen that aren't the GPLUS prints; the end title card seems to be the same 'An ITV Production for LWT' that saw service in the early 90's Video Gems videos; so nothing missing. Sadly I haven't seen them all so far to verify; but 'First Night' seemed uncut. I applaud anyone that can sit through those ITV 4 showings. The pq is breathtakingly terrible. I think even the dreadful Contender DVDs are better than the prints used on ITV 4. I don't recall the Contender DVDs being as bad as what is aired daily. Network's new sets are astounding quality. I presume their new DVDs set must be a vast improvement as well? I only have the BDs so have never seen their DVDs. Yes, the DVD's blew me away after those dodgy prints. I've got 1,2 and 3 on DVD, 4 on BD. I upgraded Mk I to BD and while I can see the difference, I would need to get 2&3 at decent prices before I'd upgrade them, which is a complement to the DVDs. I recently caught Where The Jungle Ends on ITV4 and it had been magnified so you weren't seeing the whole thing, for instance, when the title card came up, you couldn't see that Brian Clemens had written it. The DVDs look brilliant. I am seeing things for the first time that I never noticed before. For example, I genuinely never realised that Doyle's Converse boots - as seen in the series 1 opening title sequence - were red. They had never looked red to me before this! So the DVDs get a big from me. I haven't seen the Blurays but I'm in no hurry to get any, since the DVDs look so good. I can't see the whole article. 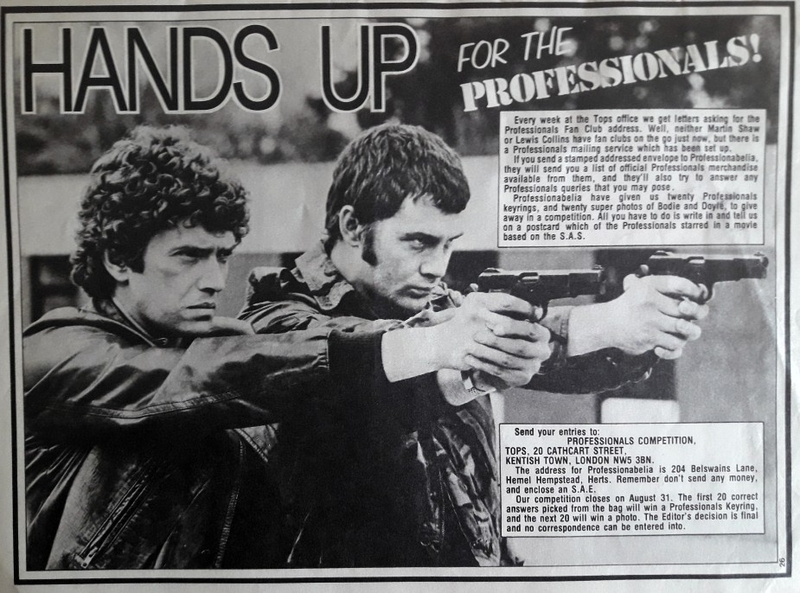 What did it say about The Professionals? If she liked the show she probably liked the movie Who Dares Wins as well. 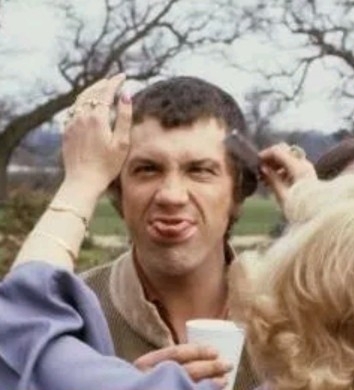 There was the Lewis Collins Friendship Circle which was a group that evolved from all the fan letters sent to Lewis. Bob Rocca would know all the facts, but apparently a group of fans answered letters, ran a newsletter and there were fan meets getting fans together. 'Professionlabila' was run by the people (editor Paula Baldwin and photographer Ted Hawes) that basiclaly worked on the Pros mags; they sold photos, keyring, annuals, etc. The LC friendship circle was as you say, but not the one you see in the picture. They originally operated from 102 London Road in Hemel Hempstead (where they worked on the mags from Colonna Press on Paradise Industrial Estate); then Belsawins Lane, and then a pub (I forget where - Luton I think) ran by Paula Baldwin, up until 1983 after which she moved to Malaga, Spain and closed the company down. Thanks for the info. 45doyle. I knew you'd know. Martin Shaw speaks Brummie. Don't know if anyone has posted this before. A major fire this week destroyed one of the boat houses , alongside the section of River Thames at Maidenhead , seen in Close Quarters . This is the second Maidenhead location , used in The Professionals to go up in smoke !! The wooden hut used for the helicopter base in Black Out , burnt to the ground in 2000 . You can just imagine Morse & Lewis taking the whole two hours & lots of pondering to work out the connection . Are they still edited for timing? Not sure , 1700-1805 so maybe not ? If they stick to that time then perhaps not. I bet the prints are still rubbish though. Dunno I've not got an HD telly lol , just finished watching "Heroes" and it finished at 1810 on the dot so I reckon its unedited - it does make a difference to the episodes by actually seeing people getting shot though ! Last time they were on ITV4 I caught 'Heroes' and they showed Bruce Boa's character get shot in the security van. Granada plus never showed that. The print was zoomed in and cropped. I can remember watching 'You'll Be Alright' on ITV in urrm (guessing) 1987 or 1988 (can someone help me out here?) and thinking the prints were bad even back then. I seem to remember watching that episode around that time as well - think it was quite late at night? That's good if they are showing these episodes uncut just like they were on first transmission by ITV. It doesn't matter much to me though as I have been watching series 2 episodes every week on blu-ray and it really is something to watch the stories in all their hi-def, crystal clear glory, making it feel as if I'm watching a recently made show that's set in the '70s (like Life On Mars). It's a sobering thought that 40 years separate these two books! Christmas Day 1978 I got the very first Professionals Annual. 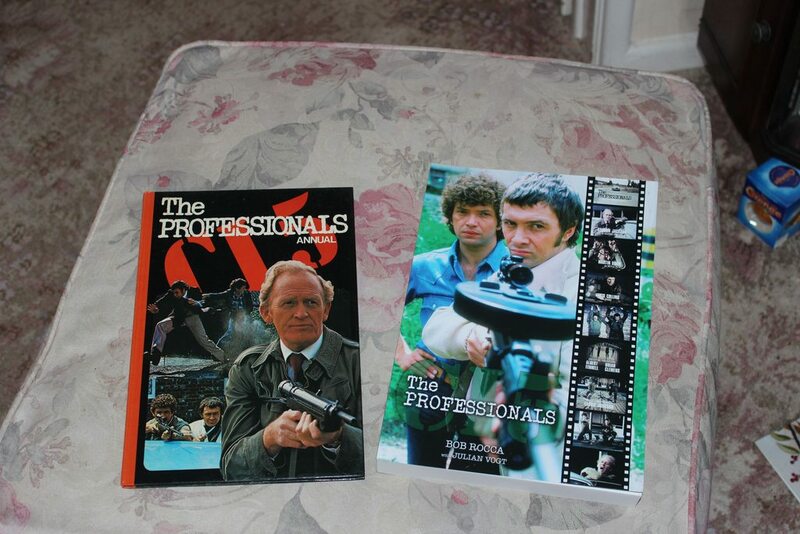 Christmas Day 2018 I got the 2nd edition of the Professionals book! And yet both seem like yesterday! 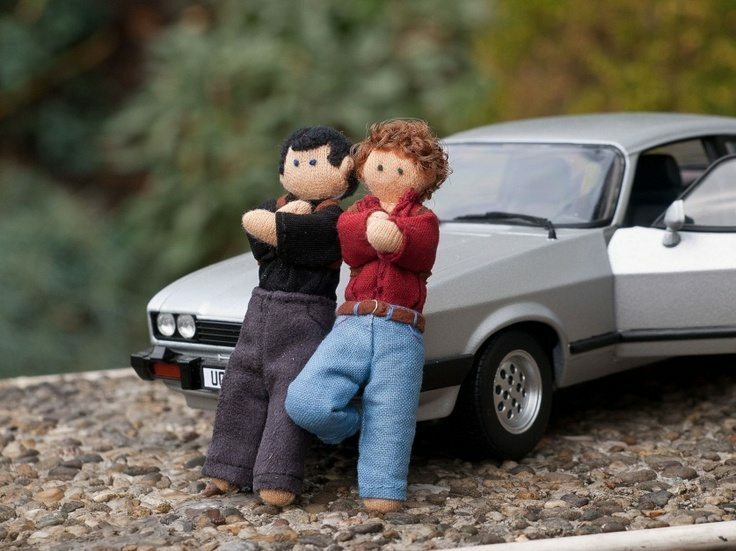 I love this photo of what looks like a knitted Bodie & Doyle with a silver Ford Capri. Now my avatar! Massively off topic, but it is great to see that your Terry's Chocolate Orange made it to the end of Boxing day fordcapri! That wasn't the case in my house.